From the blend of cow's and sheep's milk in Mugello, Tuscany by Il Forteto. 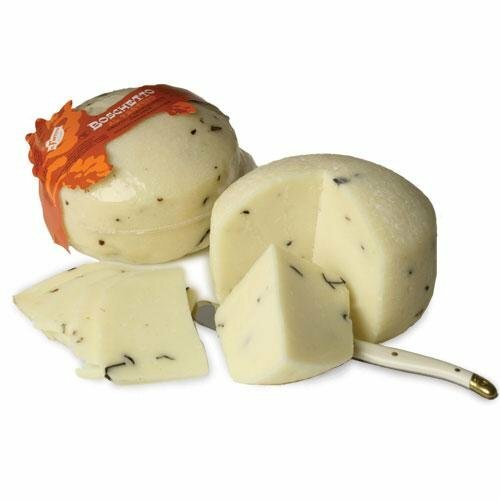 Truffle shavings are mixed in to the cheese, giving it an earthy undertone to contrast the milk's sweetness and tang. The heady aroma and delightful flavor will be enjoyed by all who partake. If you have any questions about this product by Forteto, contact us by completing and submitting the form below. If you are looking for a specif part number, please include it with your message. Wisconsin Cheese, Sausage & Crackers USA Gift Basket - features a USA Flag Mug, Wisconsin Cheeses, ORIGINAL Summer Sausage & Water Crackers - A Great Gift for Any Occasion! Specialty Gift Basket - features Smoked Summer Sausages, 100% Wisconsin Cheeses, Crackers, Pretzels & Mustard | A Great Snack or Gift Basket for Family & Friends.